The partnership between Special Olympics Iowa and Des Moines Public Schools continues to grow. 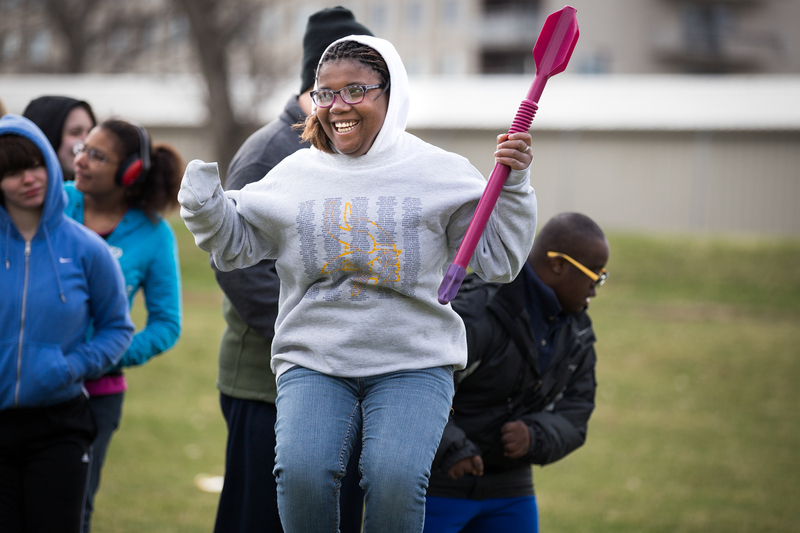 The partnership between Des Moines Public Schools and Special Olympics Iowa continues to grow with the first DMPS Unified Sports Day on April 19 at Drake University. All ten Des Moines middle schools became Unified Champion Schools last year, when staff and students moved toward creating a more inclusive environment at school, and in sports. The district is excited to share this next big step. Read the joint news release below to learn more about this special event. GRIMES, IOWA – Special Olympics Iowa (SOIA) will host the first-ever Des Moines Public Schools (DMPS) Unified Sports Day on Thursday, April 19 at Drake University from 10 a.m. to 1 p.m. Dedicated to promoting social inclusion through shared sports training and competition, Unified Sports joins people with and without intellectual disabilities on the same team. More than 300 special education and regular education students from 10 schools across the Des Moines Metro will pair up for a day of friendly competition. Partners will participate in 3-on-3 basketball, bocce, golf, pass-punt-kick football, relay races, volleyball and more. More than 100 volunteers, including representatives from local Iowa businesses, will help coordinate the events. The Unified Sports Day is the first event through the new partnership between SOIA and DMPS. In December of 2017, all ten Des Moines Middle Schools became active Unified Champion Schools, meaning that in partnership with SOIA they committed to pursuing Unified Sports, Student Leadership and School-Wide Awareness of intellectual disabilities. Next year, the district will register a number of elementary schools as Unified Champion Schools as well. WHEN: Thursday, April 19 from 10 a.m. to 1 p.m.
Special Olympics Iowa (SOIA), a statewide nonprofit organization, provides high-quality training and competition for children and adults with intellectual disabilities in all 99 counties of Iowa. SOIA offers 23 Olympic-style sports to more than 14,000 athletes and Unified Sports partners year-round. Since 1968, Special Olympics has provided an inclusive culture that stresses athletic excellence, rewards determination, emphasizes health and celebrates personal achievement. Through Special Olympics sports training and competition, children and adults with intellectual disabilities reach their full potential and experience inclusion in their communities every day.